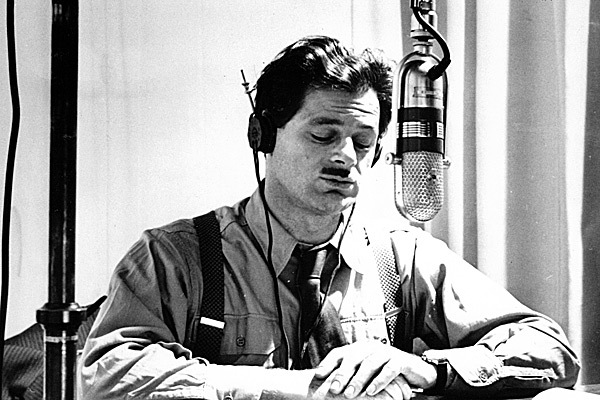 Today we salute an innovative and pioneering writer and producer, Norman Corwin. In 2011, Corwin died at the age of 101. He is known for his production of the broadcast "On a Note of Triumph," which trumpeted the Allied victory in World War II. In 1938, Corwinbegan his noteworthy radio program Words Without Music. One of his next endeavors was Columbia Presents Corwin, which took flight in March of 1944. Corwin wrote the original scripts for the programs, each of which was a documentary-style look at the topic at hand. The inaugural episode was "Movie Primer," which looked at some of the pomposity of the movie business. For his thoughtful, high-quality programs, he tapped into the Rolls Royce of available talent: Charles Laughton, Orson Welles, and Everett Sloane, to name a few. A later work of distinction was American in England, in which Corwin conducted man-on-the-street interviews with British folks during World War II. Corwin would go on to win many awards and distinctions, ultimately making it into the Radio Hall of Fame.